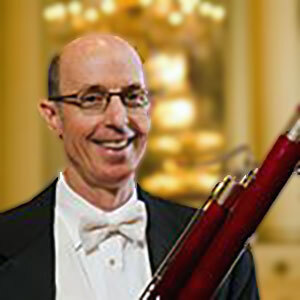 Henry Skolnick was a member of the Florida Philharmonic Orchestra, in Miami, for eighteen years and taught bassoon and wind chamber music at Florida International University for fifteen years. He has been on the summer faculty at Interlochen Arts Camp since 2004. In addition to his years in the Florida Philharmonic, he has performed with the St. Louis Symphony, The Los Angeles Philharmonic, The Chicago Symphony’s musicNOW series, The Palm Beach Opera, the Kansas City Symphony, The Colorado Symphony, the Miami Chamber Symphony, the Florida Grand Opera Orchestra and the Symphony Orchestra Berlin. He currently serves as Principal bassoon of Sinfonia da Camera, a chamber orchestra in residence at the Krannert Center at the University of Illinois Urbana-Champaign. On the baroque and classical bassoon Henry performs with The Kingsbury Ensemble, Collegium Vocale, and L’Esprit de Musique. His recordings can be heard on the Naxos, Harmonia Mundi, Albany and Innova labels.